Following a Twitter stunt in which fans had to tweet the hashtag #AvengersAssemble in order to “unlock” a new trailer—I imagine people at Marvel, drunk on their own power, screeching, “Dance monkeys, dance!” and cackling maniacally—yesterday Marvel released the final trailer for Avengers: Age of Ultron, and it’s all our dreams come true. After two trailers skirting around the plot, finally Marvel’s pulling back the curtain and giving us a clear look at the conflict facing the Avengers this time around. One of the dings against Marvel is their “villain problem”, that outside Loki, they really don’t have a compelling villain (although outside The Joker, DC doesn’t have compelling villains, either). James Spader as Ultron appears to be a concerted effort to address the villain problem—he’s f*cking scary. His voice is perfect for Ultron’s grandiose speechifying and promises to destroy hope, and now we’re getting to see Ultron in his biggest, baddest form as a towering, powerful robot. I love that we see him lounging on a throne, waxing poetic to the twins. What a classic villain move. Speaking of the twins, this is also our best look yet at Quicksilver and the Scarlet Witch, who are clearly not morally upstanding young heroes, as they throw in with Ultron. We get to see the Scarlet Witch flexing her hex powers on the Black Widow, and I love that there is a visible transfer of power when she hexes Natasha. That’s the kind of detail you can’t get in comic books, but a movie can actually show her power gathering and tangibly transferring to someone else. And let’s hear it for Quicksilver nearly taking Captain America’s head off with one punch. That shot is AWESOME. As for the Avengers, we get glimpses of each of them in action, but can we talk about how cool Natasha Romanov looks throughout the trailer? Because she looks super cool. The way she says “Well you failed amazingly,” makes my life. Scarlett Johansson consistently finds ways to elevate her performance with each appearance. I’m also way into Captain America’s sarcasm. And that shot at 1:07 of the Avengers leaping into frame looks like a live-action comic book panel. Then, right at the end, we get our first look at Paul Bettany as The Vision. I’m a ride-or-die Scarlet Witch fan for life, but even with my favorite standing right there, The Vision is THE BEST. He steals the whole movie. And for all that Bettany bitched about the extensive makeup and prosthetics for the character—that’s an actual costume, not CGI or motion capture—he looks f*cking fantastic. Look at the detail in his eyes! Incredible. And is that an infinity stone in his forehead? Why yes, I believe it is. 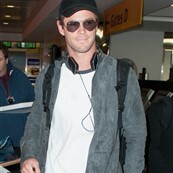 Attached – Chris Hemsworth arriving in NYC the other day in advance of hosting SNL this weekend.